Recently I have come across a number of students who think that the seat is all that is required to make their horse go forward. This is an admirable goal and can be seen with a finished horse, one that has had years of consistent training, muscle fitness and conditioning and a clear and consistent trainer. However, the majority of riders wishing to achieve this fail to recognize what goes into creating a horse trained to the seat. Many of these riders have read, heard or been told that the horse should go forward from the seat only and that no leg is required. Most of them are on horses that are hollow-backed, high-headed and not going forward to begin with, which will make the goal of going forward from the seat alone almost impossible to achieve. Using only seat aids on a hollow backed horse is like sitting on a chair with your feet off the floor. All your weight is driving into your horse’s back, which will inhibit his ability to use it correctly and can often make him sore. Therefore, I would like to dispel some myths about the use of the rider’s leg and seat and hopefully set riders straight on a course of achieving the goal of a light responsive horse that requires a minimum of aids to go forward. Notice how solid Fran’s leg is on the horse. She has contact throughout the inside of her entire calf and part of her thigh. She is very well balanced over her legs, and both horse and rider are going “forward.” If Fran needs to use her legs to give an aid to her horse they are right where she needs them, no adjustments necessary. This will result in well-timed, accurate aids when charging down to a big cross-country fence. Maybe a good way for you to relate to free forward movement is to think about the last time you went out for a walk or easy run. At first it might have been really hard to get motivated to get off the couch and leave your favorite TV program. But you finally get your shoes on and head out the door. The first half mile or so you are still thinking about the TV program you are missing, all the things you need to get done that evening and maybe even the problems at work, home or school that are nagging you. In other words, you are not focused on the job at hand —walking. Then after about 10 minutes or so you begin to find that your arms are starting to swing easily, your stride lengthens and your breathing finds a rhythm. A little later on you are moving quite easily, with very little effort and you are beginning to enjoy the walk. After about 15 minutes you are thinking how great it is to get outside, the fresh air, the scenery, the ease of your stride and you have completely forgotten about the issues that plagued you at the beginning. You are now in free forward movement! Your body has warmed up and the muscles are getting oxygen because you are working at a pace that is easy yet striding out well. You might even find you spontaneously want to jog or run for a little bit. You are now “on the aids.” Your body is responding well to your wishes. You could run for a bit, drop back to the walk, keeping that big swinging stride and then run a bit again. The only limitation now is your fitness level, which might demand you do more walking than running. Over time, however, this will change, and jogging more frequently will also become easy. When your horse is reluctant, stubborn or lazy, it is like you sitting on the couch wanting to watch your TV program instead of going for a walk. Sometimes you have to give yourself a “kick in the rear” to get you out the door. This is also true of the lazy horses. As long as there is no pain causing the laziness or reluctant attitude, such as a poorly fitting saddle, it may be necessary to use stronger aids (a quick sharp kick, a rapid tapping of the leg or even a quick flick of the whip) to get the horse’s attention that you mean business. However, if your seat or your hands are blocking the horse from moving forward, they will inhibit the desired result and the horse will have a reason to complain about your disagreeable aids. If the horse is happy to march onward, the number of aids required to maintain free forward movement can be minimized. This is just like when you were warmed up on your walk and you felt like breaking into a bit of a jog. It is easy to move if the entire body is well prepared, warmed up and the horse is happily engaged in the process of going forward. What are the aids for forward movement? 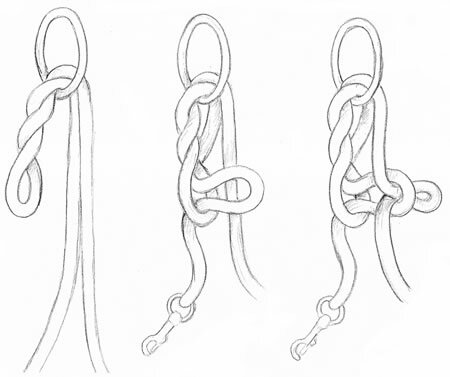 • The forward aids are the leg (primarily the lower leg), whip and spur. • The restraining aids are the reins, to tell the horse to slow down or stop. • Turning and/or bending aids are weight aids, when combined with leg and rein. I have spent many years studying and wondering about the importance and effect of the seat. In my teaching I talk about how the “seat sets direction, the legs are the accelerator and the rein limits the forward.” How much and when these different aids are used depends on the horse you are riding and whether it is an impulsive horse that needs to be held back or a lazy horse that needs to be encouraged to go forward. While there are times when the aids are used together for a combined effect, the action of the individual aids remains clear. Side to side, or forward And back? What do I mean by direct the horse’s movements? Have you ever had a really good dance partner? I know this analogy has been used ad nauseam but it really does apply! A good lead dancer can make me look like a million bucks on the dance floor. I took two years of private ballroom dance lessons to learn how to follow (not take over) and feel what it was like to have a good lead. It was amazing! I felt supported, directed, guided, relaxed, and secure. When I had a bad dance partner I felt uncomfortable, I wanted to leave the dance floor or have the dance end quickly and definitely did not feel confident in my partner. Many times the poor leader would throw me around or not recognize how sensitive I was to his signals! The analogy of the good dance partner is the same when riding. I want my horse to feel supported, guided, and relaxed because he knows he can trust where I am guiding him through my aids. Also I want to help the poor moving horse learn how to use himself more efficiently. To do this I have to control the movements in my seat, as it has huge impact on the horse’s ability to use his back correctly. The most efficient and least damaging posture for the horse is to carry the weight of the rider with the back and withers raised. Further, while the rider needs to receive all the movements from the horse (not stiffen or become rigid), she needs to filter out that which is a productive movement from that which is not productive. Many riders get caught up in the idea that the want to follow the horse’s pelvis or hind feet. The more they follow the better or more fluid their movements meld with the horse. I prefer that riders sense and feel where the hind feet are i.e. : feel the up and down, side to side and forward back directions that the horse moves but not get caught up in it. In other words, you are not sitting on the horse’s pelvis. You are sitting on the horse’s back and the function of the back is to transmit the power of the hindquarters through the back moving the entire horse forward. If you get caught up in the side-to-side movement of the horse’s pelvis and hind legs you will not assist the back in transmitting the push forward to the head. Instead you will encourage a side-to-side swing of the horse’s rib cage, which will prevent the horse from lifting the back and stabilizing the spine to propel himself forward in free forward movement. Think of it as having a great engine but no transmission to deliver the power to the front end. To test this, find a friend. Have them get on their hands and knees. With your friends back dropped, gently apply pressure with your two hands on either side of their spine just behind the shoulder blades. Notice how this puts her on the forehand. Ask her how this downward pressure feels. Now have the person on all fours lift and slightly round her back. 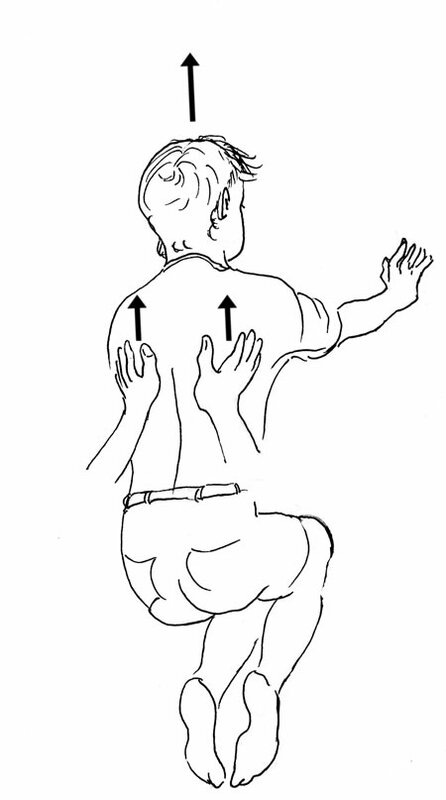 Again, at the same time, apply pressure on each side of the spine with your two hands. Notice how much stronger the back is. You will be able to apply a lot more pressure with no ill effects. Now with equal pressure on both of your hands, move your hands simultaneously forward and back. Go gently with small movements. Notice that the person on the ground will move forward and back. You might even be able to cause them to take a step forward. 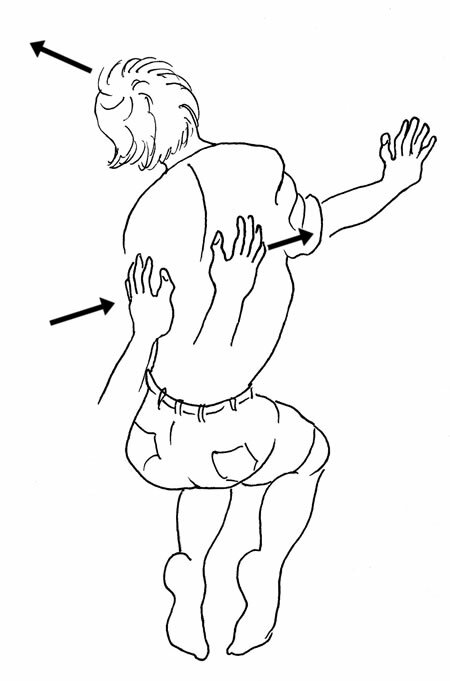 Next begin to apply pressure downward alternating side to side between your two hands so that your friend’s rib cage begins to swing. Can the person on the floor move forward or are they thrown sideways? Most likely they will sway side to side. You may be able to get them to start crawling forward but the movement will be lumbering, heavy and down and they will not willingly lift their back. When you keep your hands level and even moving forward simultaneously, your friend will move forward following the direction of your “seat” (your hands). This forward direction will allow the horse to lift the back rather than drop it, making it easier for the horse to carry your weight. You will be a lighter, kinder dance partner as a result. Finally, you are not sitting on the horse’s hindquarters. While you may sense and feel the side-to-side movement, you want the back to act like the transmission in your car and deliver the power to the front end. Therefore, you want to receive the push from each hind leg and direct it forward with your seat. There are two ways the horse can make space to advance the hind leg forward. One is swinging the rib cage side-to-side; the other is lifting the back. While many horses generate a lot of side to side swing in their ribcage when they walk, it would be better to diminish this movement and encourage the forward direction instead. A forward movement of the seat will help the horse lift the back rather than drop it. Remember you want not only to encourage movement but good movement so that your partner will enjoy your lead. I think of the rider’s seat as the key to the direction the horse moves, forward, backwards, or laterally. In addition the seat holds the key to achieving the tempo (speed) and length of stride (long or short) I want the horse to take. How? I do this by regulating the movement of my pelvis and torso, my seat. When a rider is sitting in a solid position (see my book Simplify Your Riding or my DVD Simplify Your Riding – Ride like a Natural Part 1) the pelvis is aligned with the rider’s back. The rider cannot be pushed or pulled out of position. The seat bones are pointing downward and ever so slightly forward (rather than backwards). In addition the pelvis is level. It is critical to say that the level pelvis, which, while difficult to feel and maintain, is essential to good function of the seat aids. If you sit with one seat bone lower than the other you will pivot around one seat bone or continually drop off to one side of the horse. This will inhibit the ability of your pelvis to move in a forward direction with the horse. Sensing and feeling when your pelvis is level is worth the effort if your goal is to have your horse move forward from your seat alone. Without a level seat you will have to resort to wiggling or pumping with your seat to get your horse to go. 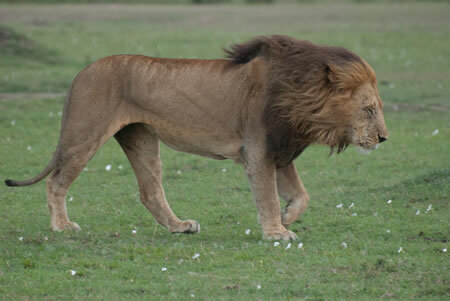 While he might move, it will be almost impossible for him to move freely forward as described above. Using the seat to set the direction for the horse is a very small movement! If I can see it emphasized, then the rider is probably doing too much because the horse did not respond. In other words, when the horse is listening to the seat the slightest indication will be received and obeyed. But if I see the rider pushing, pumping, or massaging the saddle, then it is clear to me that she needs to decrease the movement in her seat (as it hasn’t worked or I wouldn’t see it!) and use her leg to get the horse to respond. Hence the legs are the accelerator. When the legs are used as the accelerator, I am referring to both legs used at the same time. How strongly and in what way is dependent upon your horse. At first, this may take some experimentation to figure out. 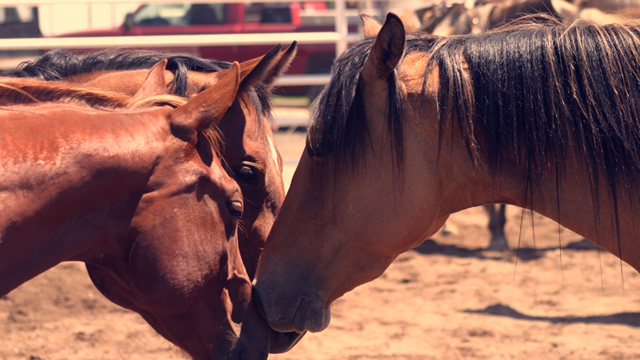 Some horses respond to a light hug, others to taps. Horses that have become dead to the leg will need convincing that they should move forward. A sharp quick kick might be in order. Those horses that have really lost sensitivity to the leg will require a skilled application of the whip behind the leg. How much or how little cannot be written about in an article. This is something you have to experiment with and judge for yourself given the horse you are on and the response you receive from your request. Only you can determine how much or how little leg you need. I often see riders using too much leg on a sensitive horse. The riders give a sharp quick leg aid and the horse startles instead of moves off quietly. Other riders don’t use enough on a dull or lazy horse. How strongly and the manner in which you use your leg aids can change not only from day to day but quite quickly within a single ride. In fact, if you have used your aids effectively, you will discover that you need less and less as your horse becomes increasing sensitive to your leg aids. If you are riding a dull, heavy school horse that has been nagged daily and become dull to the leg, your leg along the whip might be needed to get the horse to pay attention. A word of caution here: When using your whip or rope, especially on a horse that is not responsive, make sure you give the horse sufficient rein so that you are sending only one clear signal – go! Pulling on the rope or rein at the same time as using your leg, whip, spur or rope would be like stepping on your car’s brake and accelerator at the same time. You could wind up spinning the wheels. At the least you could confuse your horse, at the most he might strongly object to your poor riding and let you eat some dirt! If you are concerned about your balance or worried about hitting your horse in the mouth (or nose with a rope halter), then grab a piece of mane or a neck strap to make sure you aren’t punishing him for doing what you ask. I prefer a long dressage whip to a short bat or rope. The reason being that I can make a moderate leg signal followed by a quick accurate movement with my whip. It takes a great amount of skill to swing your rope without shifting your body weight and time it within 3 seconds after you have used your legs. More than 3 seconds and the horse will not associate the leg with the rope or whip; therefore, timing and accuracy are critical. By now I can hear readers thinking – “I wouldn’t use a whip!” “I don’t want to hit my horse!” “I don’t want to kick my horse to make him go!” Well, the bottom line is if you don’t establish a boundary in the beginning, you will always be trying to find ways around the issue. I am not talking about beating your horse with a stick. There is a difference between a well-timed, quick tap with a whip and a lashing. Worse is the person who won’t put any kind of assertion behind the whip. Then the whip or rope becomes just another nagging attempt to coerce the horse instead of setting a definite boundary. Clear, objective boundaries are important for horses, dogs and children. They allow the individual to know where they stand and take away the anxiety produced by ambiguous or mixed signals. If you have ever trained a puppy, you will know that if you don’t establish your boundaries in the beginning, you might not wind up sleeping in your own bed in a few months. However, once established, it takes little to maintain and provides certain comfort to everyone involved. Most often the whip is needed because someone has dulled the horse to the aids by unconsciously banging on his sides with her legs. As a result, the reschooling necessary requires reestablishing the meaning of the leg aids. Ms. Harris has an excellent description of schooling your horse to light forward leg aids on page 15 of the C-Level Pony Club Manual mentioned earlier. I will not repeat it here, as she has done such a excellent job of describing schooling the horse to the rider’s leg. 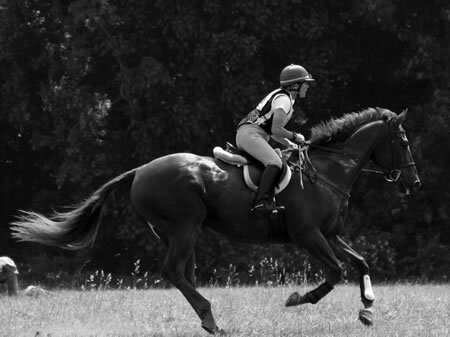 The process includes definite (not harsh) correction when the horse doesn’t respond and praise when the horse does respond, along with timing, which is the key to all good training. Waking up your horse to the leg requires good coordination and timing. Remember the goal is the have the horse responsive to a light signal. Constant nagging with your leg will only make the horse more dull and unresponsive. This is also true when using the whip, stick or rope. Some people use spurs, but I prefer to use the whip on a dull horse because using the spur can cause the rider to turn the heel in and block the seat’s ability to go forward with the horse when he offers to move. With equal pressure on both hands, move both hands forward simultaneously. Go easy! See how little pressure you need to move your “horse” forward slightly. When pressure is applied alternately left and right (right hand sending the ribcage of your “horse” to the left then left hand sending the rib cage of your “horse” right, you will get a swinging action in the rib cage. 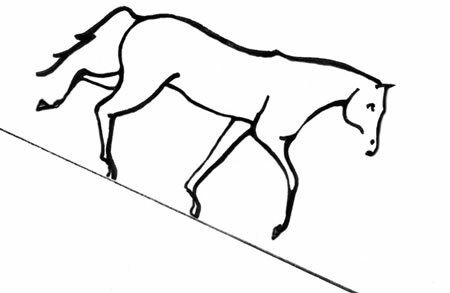 The “horse’s” head will generally move in the opposite direction of the rib cage. 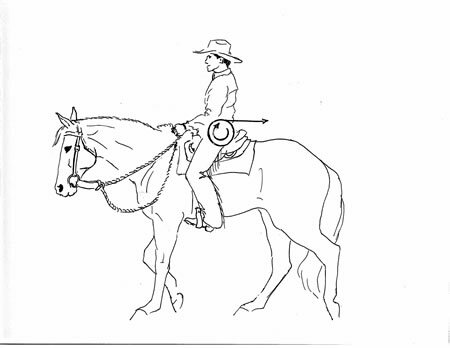 In other words, using alternate pressure of your seat left and right will cause the horse to swing the rib cage side to side, which causes a “waddling” effect resulting in a decrease of forward motion. So how do we arrive at achieving a horse that goes forward from the seat only? 1. Your horse has to willingly have free forward movement in order for him to respond to a seat aid only. 2. The leg aids ensure the horse moves freely forward using both legs simultaneously in the manner and intensity that works best for your horse. 3. If your horse does not respond to light leg pressure or taps, you may need to make him more responsive to the legs by schooling him to the leg aids (see C-Level Manual USPC, page 16). 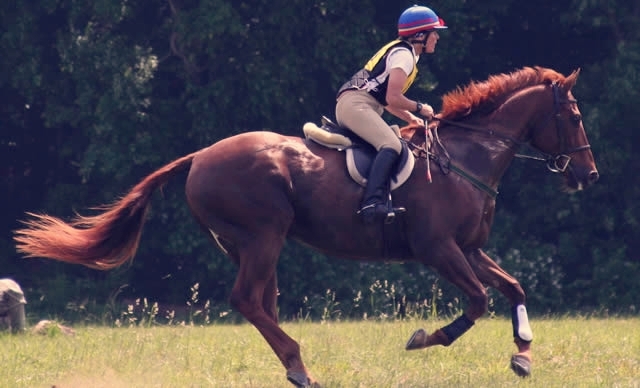 Please note: if the horse becomes worse instead of better, look for pain issues such as a poorly fitting saddle, a sore back or a very crooked rider, which may be inhibiting the horse’s ability to respond appropriately. 4. Lengthen through your spine in preparation to asking the horse to move forward. This will slightly lighten your seat and make a space for your horse’s back to come up underneath you. 5. Apply your leg aid as you direct your seat forward (not sideways) for the horse to move forward. 6. 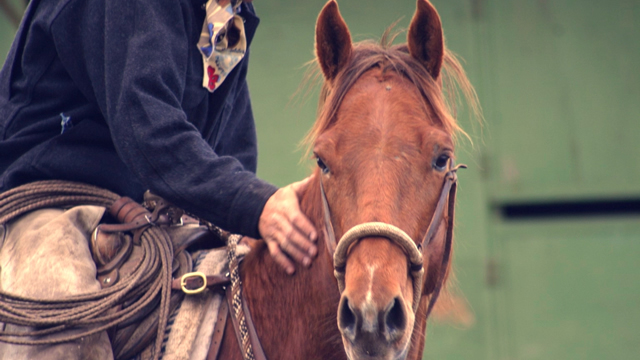 Maintain consistency with the manner in which you ask the horse to move. 7. As your horse becomes more responsive to the aids, he will require fewer leg aids. Make sure you are listening to how much or how little you need each time you ask your horse to go forward. Promptness is essential. 8. If your horse is not listening, go back to step 1. How long it takes to move through this process depends on fitness, health, pain, comfort, consistency and attentiveness of the rider. Some days will be better than others. However, overall you should see continued improvement in your horse’s response to your aids if you stay objective and be honest with yourself. Remember the seat directs the forward movement but doesn’t create it! The legs create the forward, which is received by the seat to be directed where you want the horse to go. If your horse is listening, then the leg aids become less and less until it is simply lengthening through your spine and directing your seat. And remember, you can make yourself (and your horse) crazy with this stuff if you get too intense. Give yourself a break and enjoy a trail ride every now and then so that your riding remains something you and your horse enjoy.